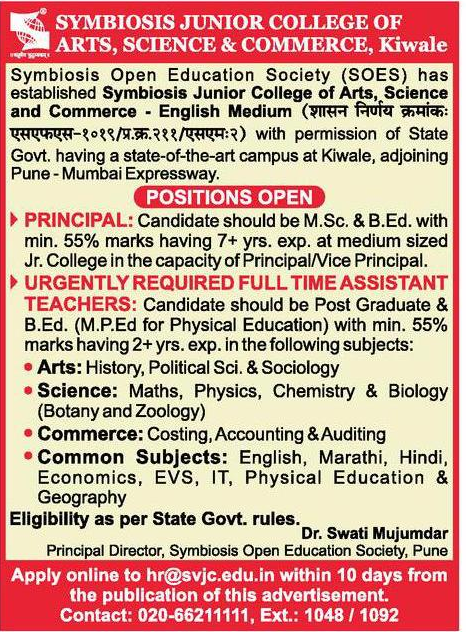 Symbiosis College Pune (Symbiosis College of Arts Science & Commerce), Pune published a new job notification for Principal & Assistant Teacher Posts. The willing candidates are informed to see the latest notification March 2019. Qualification required M.Sc/B.Ed/Post Graduate/MP.Ed and More. Last Date of offline application is 31-03-2019. For More details of Symbiosis College Pune Recruitment 2019 Read Below. Education Qualification: M.Sc/B.Ed/Post Graduate/MP.Ed and More. For Post wise Education Details follow the detailed advertisement.